The 36-foot yacht 'Old School' is pulled from the water at Norwalk Cove Marina Friday evening after it struck a reef near Cockenoe Island about a mile offshore of Westport. Two people were rescued from a sinking yacht Aug. 3 after it struck a reef about a mile offshore of Westport near Cockenoe Island. Marine rescue crews from Westport, Norwalk, Darien and the U.S. Coast Guard raced to the scene shortly after a Mayday distress call came in at 4:30 p.m. from the 36-foot yacht Old School out of Black Rock Harbor in Bridgeport, according to a statement from Westport police Lt. John Pitoniak. Westport Marine Police were first on the scene and removed the two passengers of the 1978 Trojan yacht. The passengers were not identified and Westport police said they are continuing to investigate the incident, Pitoniak said. 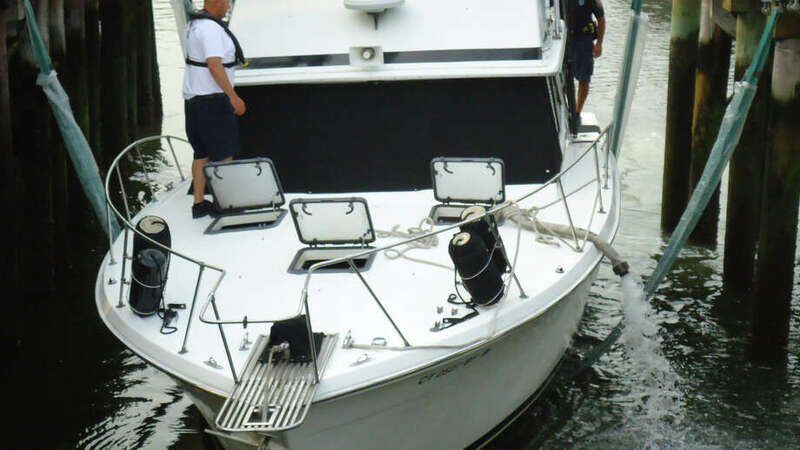 The emergency responders were unable to plug the leak to keep water from rushing into the yacht, but they were able to keep it afloat using pumps to remove the water. Two boats from Sea-Tow, a private marine salvage and towing company, towed the boat to the nearby Norwalk Cove Marina, while Westport police and Norwalk fire crews continued pumping out water. Once the boat was brought in to the marina, it was lifted out of the water using a sling lift at about 6:15 p.m. There were about 100 gallons of diesel fuel on board the yacht, and Norwalk Deputy Fire Chief Edward Prescott said emergency crews were able to prevent an environmental incident from impacting area shores and maritime industries.